The Köln International School of Design (KISD) and especially professor Birgit Mager was invited by the Design Academy of Eindhoven to analyse the problem of street prostitution by addicted women and to find solutions through the method of ‘service design’. The KISD has positive experience in using this approach for developing services for homeless people in Köln. Whe just want to say, that not only the KISD was involed by the project and the Design Academy but also T+HUIS in Eindhoven. Whe workt the hole project special with the students of the KISD and prof. Mager. Dear people from T+HUIS. Thank you for pointing this out to me. I looked at your website and you do great work! I like your explanation of 'service design', I never heard it explained that way before :). DesignThinkers is a strategic design agency specialized in business, service and social innovation/ transformation. 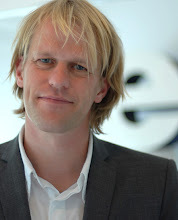 Owner and Strategic Design Director at DesignThinkers, lecturer and chairman of the Service Design Network Netherlands (Service Design Netwerk Nederland). Service Design professionals and supporters are gathering on LinkedIn. Our aim it is to develop, professionalize and promote the relative new field of expertise called Service Design (and related subjects).